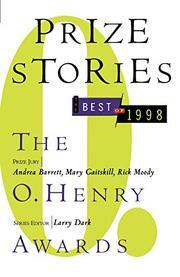 This latest installment of the venerable O. Henry winners, edited by old-hand critic Dark (Prize Stories 1997, etc. ), provides some pleasures amid few surprises. “You are what some would call a serious reader,” Dark assures us at the start. —The very fact that . . . you are interested in these twenty stories is proof enough.” But it’s not all work and no play, for many of the entries here manage to entertain as well as mean. The obsessive introspection that has nearly killed the short story as a popular art form is largely absent, and traditional narrative seems to be enjoying a comeback, if the pieces offered this time around serve as any guide. Lorrie Moore takes First Prize with “People Like that Are the Only People Here,” a mother’s account of her baby’s illness in which self- conscious irony (“The Tiny Tim Lounge is a little sitting area at the end of the Peed-Onk corridor”) verges on black humor while staying just within the boundary of good taste. Second Prize—winner Steven Millhauser’s “The Knife Thrower” describes in almost gothic prose the Svengali-like effect of a carnival actor upon an audience of small-town folk (“We had heard that among his followers there were many, young women especially, who longed to be wounded by the master and to bear his scar proudly”). Alice Munro’s Third-Prize—winner, “The Children Stay,” is more in the contemporary mode: an almost disembodied recollection of a woman’s adultery and then abandonment of her family that becomes finally more ponderous than meditative. Several backwoods pieces—Rick Bass’s “The Myth of Bears” (Yukon trappers) and Annie Proulx’s “Brokeback Mountain” (Wyoming ranchers)—manage to resuscitate old-fashioned realism with local color, but the best is Louise Erdrich’s “Satan: Hijacker of a Planet,” a taut, extraordinarily eerie description of a country girl seduced by a charismatic revival preacher. Definitely worth picking through, even for readers who aren’t all that serious.